A Taste for Red by Lewis Harris. Clarion Books, an imprint of Houghton Mifflin Harcourt. 2009. Reviewed from Advance Reader's Copy from publisher. Middle Grade, supernatural. The Good: Svetlana used to be Stephanie, until it dawned on her that she is really a vampire and demanded her parents start calling her Svetlana. What vampire is named Stephanie, anyway? The clues to Svetlana being a vampire: only eating red food. Sleeping under her bed. Heightened senses. Reading another's thoughts and sometimes even controlling them. At first, when I began this book, I thought that Svetlana came from a vampire family. When I realized she did not, and that her parents were unaware she was a vampire, I thought this would be about a lonely formerly homeschooled girl who believes herself to be a vampire. Within a few pages I discovered that wasn't true, either. Svetlana does have supernatural powers. Vampires do exist. It turns out that Svetlana has simply misidentified what she is; a hunter of vampires rather than a vampire. With the help of an elderly neighbor, Svetlana learns more about her abilities, discovers the town vampire, and tries to save fellow classmates from the clutches of the vampire. Along the way, we find out more about Svetlana (who is delightfully snarky and world weary) and her very understanding family. Of course her family has to be understanding, if they are indulging in her "only eat red food" preferences. Though, of course, her mind control helps with that. A sample of Svetlana's delightful narrative style: "Please. My cousin in Texas has a trampoline. As I recall, the thrill lasted about two minutes. Why would anyone ever get on a trampoline twice? In my opinion, a trampoline is basically a Darwinian device for thinning the herd." Given her attitude, one can understand why she quickly realizes and believes that there is something unique about herself. 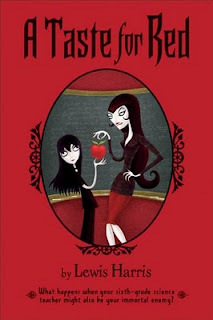 A good addition to vampire books, especially for the fourth to seventh grade age set. Also good: after Svetlana's misdiagnosis of her own abilities, it turns out that the vampires are the baddies after all. Good to recommend to the middle grade age group, not just because it fills the request for vampires and horror, but also because the main character is active. This isn't a "oh noes bad guys! run away and survive!" book; it's "oh noes bad guys! let's do something about it." And yes... I am amused that Svetlana's birth name is Stephanie. A very interesting review. I now want to read the book. I am putting it on my to read list. Sounds TOTALLY up my 8- and 11-year-old daughters' alley. Thanks for the heads up. It is really cute and a nice match for the goosebumps set. Plus a few good in jokes, like Svetlana instead of Stephanie. I went into this book not sure if it would pass my minimum page test, but the cute twist on vampire books kept me at it. I really liked the sharp neighbor, too.